The native form of this personal name is Mun Jung-hyuk. This article uses Western name order when mentioning individuals. 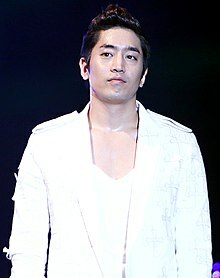 Eric Mun (born Mun Jung-hyuk on February 16, 1979) is a South Korean singer and actor. He is a member and leader of the South Korean boy band Shinhwa. He is also well known for several dramas such as Phoenix (2004), Super Rookie (2005) and Another Oh Hae-young (2016). He was with Top Class Entertainment from 2007 to December 2013. In 2014, Mun and his manager of 10 years, Lee Jong-hyun, set up a new management agency, E&J Entertainment, for his individual activities. Mun is also the CEO of Shinhwa Company, the home agency of his group, with Lee Min-woo as co-CEO since 2011, and with the remaining members—Kim Dong-wan, Shin Hye-sung, Jun Jin and Andy Lee—as shareholders. Phoenix is a 2004 drama/romance South Korean television series starring Lee Seo-jin, Lee Eun-ju, Jung Hye-young and Eric Mun. It aired on MBC from April 5 to June 29, 2004 on Mondays and Tuesdays at 21:55 for 26 episodes. 2016: "Another Oh Hae-young" and "Three Meals a Day"
D. Russell Parks Junior High School is a junior high school located in Fullerton, California, United States. It serves students in seventh and eighth grades, and is part of the Fullerton School District. The school has been recognized on two separate occasions with a Blue Ribbon School Award of Excellence by the United States Department of Education, the highest award an American school can receive. Parks' mascot is the Panther. In 2005, Mun graduated from Dongguk University with a major in Theater and Film. Dongguk University is a private, coeducational university in South Korea, based on Buddhism. Established in 1906 as Myeongjin School by Buddhist pioneers of the Association of Buddhism Research, the university gained full university status as Dongguk University in 1953. The university remains one of the few Buddhist-affiliated universities in the world, and is the member of International Association of Buddhist Universities. In 2002, Mun and his Shinhwa bandmates had cameo appearance in the movie Emergency 19 Act. In 2003 director Park Sung-soo cast him in a supporting role for MBC’s series Breathless (I Run). In early 2004, he appeared in the drama Phoenix (Bulsae). Han Ga-in is a South Korean actress. She starred in television series Yellow Handkerchief and Terms of Endearment early in her career, and became a sought-after model in commercials. Her projects in 2012 were hugely successful, with her period drama Moon Embracing the Sun topping the TV ratings chart, and her film Architecture 101 becoming a box office hit. 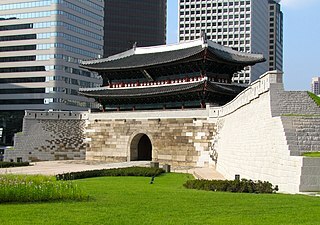 Namdaemun, officially known as the Sungnyemun, is one of the Eight Gates in the Fortress Wall of Seoul, South Korea, which surrounded the city in the Joseon dynasty. The gate is located in Jung-gu between Seoul Station and Seoul Plaza, with the historic 24-hour Namdaemun market next to the gate. On February 8, 2013, Shinhwa’s agency announced the group’s 2013 Shinhwa Grand Tour: The Classic to commemorate the group’s 15 years since their debut was revealed. The album's name called The Classic . Mun along with Shinhwa won Mwave Global Star Awards  as well as many music shows awards   and a Triple Crown on M Countdown  for their music comeback. After Shinhwa's 18 Anniversary in March, Mun returned to acting and appeared in the South Korean TV cable (tvN) drama Another Oh Hae-young with Seo Hyun-jin. The drama premiered on May 2 with better rating than its predecessor Pied Piper. It broke its projected rating of 5% of on its 6th episode and becomes tvN's all-time highest rated drama for their Monday - Tuesday time-slot with the rating of 9.9% for its final episode. Another Oh Hae-young team was rewarded a trip to Thailand after the drama ended. At tvN10 Awards on October 9, Mun was awarded the title of "Ro-co King". Seo Hyun-jin was also crowned "Ro-co Queen" for their roles in Another Oh Hae-Young. On September 16, in a preview for the new season of tvN "Three Meals a Day", it showed Mun joined as a cast member for Season 3 of Three Meals A Day - Fishing Village 3  with Lee Seo-jin and Yoon Kyun-sang. This season of Fishing Village was filmed at Deukryang Island. The season premiere was on October 14. It was Mun's first appearance as a cast member of a variety show without Shinhwa. Mun surprised everyone with his great cooking skills that earned him the E-Chef title. The show had great rating of above 10% on average with the highest rating of 11.536% (AGB) 13% (TNmS). At the end of November 2016, Mun and Shinhwa released a mini album Unchanging: Orange as part one of their 13th album. Mun was chosen to be the model for Jean Michael Basquiat a new premium golf wears and accessories by CJ E&M and ULOS, a Men's cosmetics & skincare by Ostuka Korea. Shinhwa followed up with a comeback in January 2017 with Unchanging: Touch as the second part of their 13th album. On March 24, Shinhwa released Shinhwa 18th, their first self-produced variety show through Naver's paid subscription platform for Vapp+. On January 1st, it was announced that Eric has joined his bandmate Andy at TOP Media  . To everyone's surprise, Eric creates his own Youtube channel aguTV to share a various contents, from cookings, outtings to how he failed to get a ticket for his own fan meeting. The following month, on February 16th, he held a birthday fan meeting "2019 ERIC's Moonday" at Kwanglim Art Center, BBCH Hall. Eric was also cast in tvN's Season 3 of "Will The Locals Eat It?" in America  (also known as 4 Wheeled Restaurant). The show premieres on April 18th. Eric is expected to make a come back to drama this year. It was reported that Eric and Go Joon-hee are in talk to join KBS's fantasy rom-com drama "Perfume"  . The drama is set to be broadcast in June. Lee Hyo-ri is a South Korean singer, record producer, activist, actress and television presenter. Dubbed as the "Nation's Fairy" during her Family Outing days, she debuted as a member of South Korean girl group Fin.K.L, but has since become a solo artist. In 2003, she released her debut solo album Stylish which won several "Artist of the Year" awards. In 2006, Lee was the highest-paid female singer in South Korea when she signed a contract with Mnet Media. Park Shin-hye is a South Korean actress and singer. She gained recognition for starring in melodramas Stairway to Heaven (2003) and Tree of Heaven (2006). Considered one of the most prolific actresses of her age, Park received further recognition for her roles in the television dramas You're Beautiful (2009), The Heirs (2013), Pinocchio (2014–2015), Doctors (2016) and Memories of the Alhambra (2018–2019). Danny Ahn is a Korean-American entertainer best known as the main rapper of the South Korean pop music group g.o.d. He is notable for his unique rapping. Having made his debut in the entertainment industry as a member of g.o.d in 1999, Ahn has gone into acting and has also been a radio DJ and MC. Kim Hyun-joong is a South Korean actor, singer and songwriter. He was a member of the boy band SS501 and played roles in the Korean dramas Boys Over Flowers, and Playful Kiss. Kim Jae-wook is a South Korean model and actor. He is best known for his roles in the hit series Coffee Prince (2007), comedy film Antique (2008), mystery drama Who Are You? (2013), and thriller drama Voice (2017). Ok Taec-yeon, known mononymously as Taecyeon, is a Korean rapper, singer, songwriter, actor, and entrepreneur. He is the main rapper of the South Korean boy group 2PM. Song Joong-ki is a South Korean actor. He rose to fame in the historical drama Sungkyunkwan Scandal (2010) and the variety show Running Man as one of the original cast members when it premiered in 2010. Song played his first TV leading role in the melodrama The Innocent Man (2012). He has also starred in feature films, notably as the title character in the box office hit A Werewolf Boy (2012). Discovery of Love is a 2014 South Korean television series starring Jung Yu-mi, Eric Mun, and Sung Joon. It aired on KBS2 from August 18 to October 7, 2014, on Mondays and Tuesdays at 21:55 for 16 episodes. Kim Jun-hyun, is a South Korean comedian, signed under JDB Entertainment. She Was Pretty is a 2015 South Korean television series starring Hwang Jung-eum, Park Seo-joon, Go Joon-hee and Choi Si-won. It aired on MBC from September 16 to November 11, 2015, on Wednesdays and Thursdays at 22:00. Kim So-hye is a South Korean actress and singer signed under S&P Entertainment. She is best known for finishing fifth in Mnet's K-pop girl group survival show Produce 101 and for being a member of girl group I.O.I, and her roles in Poetry Story, Kang Deok-soon's Love History, and Best Chicken. Na Hye-mi born on February 24, 1991 is a South Korean actress and model. She made her first screen debut with a supporting role in Address Unknown movie when she was 10 year-old. After Unstoppable High Kick, Hye-mi took a long break from acting to complete her studying. Hye-mi was model for various CF such as Samsung notebooks M, Kia Morning, Acuvue, KB card... as well as magazines like ELLE Girl, Ceci, Vogue, bnt, Cosmopolitan. ↑ "Way Back Wednesday: Shinhwa | allkpop.com". allkpop. Retrieved 2016-12-03. ↑ "Eric Steps Out of Character for Recruit". Chosun Ilbo. 7 April 2005. Retrieved 2011-11-08. ↑ 수미 (17 July 2011). "[11.07.15] 10asia's 10 Line feature: Eric". wordpress.com. Retrieved 14 January 2017. ↑ Kim, Jessica (29 October 2009). "Han Ga-in signs with Kim Ha-neul's agency". 10 Asia. Retrieved 2012-04-05. 1 2 "Is it all over already? Gloomy signs overshadow rosy statistics of 'Hallyu'". hancinema.net. Retrieved 14 January 2017. ↑ "Huge Crowds Greet Eric's Arrival in Tokyo" Chosun Ilbo. 19 December 2005. Retrieved 2011-11-08. ↑ "Eric Hurt in Gallant Attempt to Save Han Ji-min". Chosun Ilbo. 23 January 2006. Retrieved 12 February 2011. ↑ "Moon Jeong-hyeok Chooses Interesting Roles" Dong-A Ilbo. 31 August 2006. Retrieved 2011-11-08. ↑ "Shinhwa member Eric returns to TV as the highest-paid singer-turned-actor". AFspot. Sports Hankook. Archived from the original on 4 March 2016. Retrieved 25 April 2015. ↑ "Shinhwa Eric, Army Enlistment Date to be 2008". ↑ "Shinhwa Eric Mun gave up his American Citizenship to serve in the army". ↑ Choi Jun-yong "Shinhwa Eric discharged from military" 10 Asia. 1 November 2010. Retrieved 2012-04-05. ↑ Kim, Jessica (2 August 2011). "Choi Si-won, Lee Si-young embark Poseidon". 10Asia. Retrieved 2012-04-05. ↑ Hong, Luica (1 June 2011). "Eric to make comeback to small screen in Han Ye-seul starrer". 10 Asia. Retrieved 2012-03-21. ↑ Kwon, Mee-yoo (10 July 2011). "Drama explores inter-Korean love story". Korea Times. Retrieved 20 July 2011. ↑ "Shinhwa Form Their Own Agency" Chosun Ilbo. 3 August 2011. Retrieved 2011-11-05. ↑ Ho, Stewart. "BEG's Gain's 'Nostalgia' to Feature Shinwha Eric's Rapping". enewsWorld. CJ E&M. Retrieved 25 April 2015. ↑ ""Shinhwa Thanks Global Fans for 20's Mwave Global Star Award at '20's Choice Awards"". Mwave. July 18, 2013. Archived from the original on August 30, 2017. Retrieved July 18, 2013. ↑ "Shinhwa Grabs 1st TV Music Show Crowns on Music Core". 10Asia. 10Asia. 20 April 2012. Archived from the original on 2013-11-15. ↑ "Shinhwa No. 1 on Mnet's music show with "Venus"". Mwave. 25 May 2013. ↑ "[M COUNTDOWN Hall of Fame] Shinhwa's 'Brand New'". Mwave. 7 June 2013. ↑ "[News] Eric doesn't produce Stellar anymore...already left his agency". tumblr.com. Retrieved 14 January 2017. ↑ "에릭, 스텔라 프로듀싱에서 손 뗐다…소속사와 결별" (in Korean). ↑ "Eric announces an official position regarding casting in 'Trot Lover'". starnnews.com. Retrieved 14 January 2017. ↑ "[News] Mention of Eric in 'Golden Cross' article". tumblr.com. Retrieved 14 January 2017. ↑ "KPOP NEWS - Shinhwa's Eric Confirmed for 'Discovery of Romance' with Jung Yumi - Mwave". interest.me. Retrieved 14 January 2017. ↑ "Eric Mun, Jung Yu-mi together again". joins.com. Retrieved 14 January 2017. ↑ "allkpop - Breaking K-pop news, videos, photos and celebrity gossip". allkpop.com. Archived from the original on 2016-03-03. Retrieved 14 January 2017. ↑ "2015 Rockie Awards". BANFF World Media Festival. Archived from the original on 23 April 2015. Retrieved 25 April 2015. ↑ "Netizens discuss their favorite male leads". koreaboo.com. 27 September 2015. Retrieved 14 January 2017. ↑ "» 2016 tvN10 Awards (Winners List) » Korean Drama". koreandrama.org. Retrieved 14 January 2017. ↑ Hong, C. (16 September 2016). "Lee Seo Jin And Shinhwa's Eric To Appear On "Three Meals A Day"". soompi.com. Retrieved 14 January 2017. ↑ "170202 CJ Cheil Jedang, Convenient Food 'Bibigo Yukgaejang' TV commercial with Shinhwa's Eric is on Air". ALL ABOUT ERIC MUN. Retrieved 2017-04-15. ↑ "170331 Netmarble 'Lineage2 Revolution' Reveal Web Drama Feat. Kim Sangjoong, Kim Myungmin, Shinhwa's Eric". ALL ABOUT ERIC MUN. Retrieved 2017-04-15. ↑ "Netmarble 'Lineage2 Revolution' Reveal Web Drama Feat. Kim Sangjoong, Kim Myungmin, Shinhwa's Eric". Enews. 2017-07-31. Retrieved 26 March 2019. ↑ "Eric Mun's Agency Confirms That He Is Dating Actress Na Hye Mi". Soompi. 2017-02-23. Retrieved 24 March 2019. ↑ "Eric Mun Ties the Knot with Actress Na Hyemi". Chosun. 2017-07-03. Retrieved 24 March 2019. ↑ "K-Pop Boy Band Shinhwa Celebrates 20th Anniversary With Remake of 'All Your Dreams' Music Video". Billboard. 2018-03-27. Retrieved 26 March 2019. ↑ "Shinhwa To Kick Off Celebrations For 20th Debut Anniversary With Special Fan Party". Soompi. 2018-01-28. Retrieved 26 March 2019. ↑ "Shinhwa Celebrates 20th Anniversary With 'Kiss Me Like That' Video". Billboard. 2018-08-29. Retrieved 26 March 2019. ↑ "Legendary K-pop group Shinhwa is back with special album". The Korea Times. 2018-08-29. Retrieved 26 March 2019. ↑ "Shinhwa release their 'Heart' to the world". Gulf News. 2018-09-02. Retrieved 26 March 2019. ↑ "Shinhwa Brings Legendary 20th Anniversary Performance In Taipei". Hello Kpop. 2018-10-16. Retrieved 26 March 2019. ↑ "2018 Shinhwa 20th Anniversary Concert Heart Tour in Hong Kong". Asia World Expo. Retrieved 26 March 2019. ↑ "Eric Signs On With TOP Media And Becomes Labelmates With Fellow Shinhwa Member Andy". Soompi. 2019-01-01. Retrieved 26 March 2019. ↑ "Shinhwa's Eric Experiences The Difficulties Of Buying Tickets For His Own Fan Meeting". Soompi. 2019-01-27. Retrieved 26 March 2019. ↑ "Shinhwa's Eric To Hold A Solo Fan Meeting For The First Time In Eight Years And It's On His Birthday". Hello Kpop. 2019-01-24. Retrieved 26 March 2019. ↑ "Shinhwa's Eric To Head 3rd Season Of tvN Variety Show "4 Wheeled Restaurant"". Soompi. 2018-02-11. Retrieved 26 March 2019. ↑ "Shinhwa's Eric And Go Jun Hee In Talks For Fantasy Rom-Com Drama". Soompi. 2019-02-01. Retrieved 26 March 2019. ↑ "Shinhwa's Eric Mun and Actress Na Hyemi are said to be in 'Loving relationship'". Yonhap Korea. 2014-04-09. Retrieved 24 March 2019. ↑ "Eric Mun & Na Hye Mi Reveal Past Dating Rumors To Be True". Korea Portal. ↑ "Shinhwa's Eric ties knot with actress Na Hye-mi". The Korea Herald . July 2, 2017. ↑ Oh, Jean (5 July 2011). "Eric comes back with TV rom-com". Korea Herald. Retrieved 13 June 2013. Wikimedia Commons has media related to Eric Mun .